Dr Orestis Georgiou, Director of Research, writes about how a study at Glasgow University demonstrated that mid-air haptic feedback improves gesture interactions. Gesture control is an increasingly common form of interface across many sectors, including desktop computers, gaming, interactive displays and automotive. However, in current gesture control systems, users can gesture, but they cannot feel the controls they are interacting with. A team of human computer interaction (HCI) researchers from Glasgow University decided to find out whether this mattered. Using Ultrahaptics’ mid-air haptic technology, Dr Dong-Bach Vo and Professor Stephen Brewster put together a user study to determine whether adding haptic feedback to gesture controls would improve performance. Ultrahaptics’ core technology controls the emission of ultrasound waves from an array of ultrasonic transducers and manipulates them so that the combined pressure of the waves interacting produces enough force to be felt on a user’s skin. When multiple pressure points are created, the user can feel 3D shapes, buttons, sliders and virtual objects in thin air. Using a device made up of a horizontal screen, an Ultrahaptics array and a Leap Motion® camera module, Dr Dong-Bach Vo and Professor Stephen Brewster designed a study that asked participants to match their index finger to the coordinates of a randomly generated virtual target floating within a square 13x13cm plane centred 20cm above the device. When the user was happy with the location of their finger they pressed an Enter key on a keyboard with their other hand. The researchers tested the speed and precision with which users located the target under three different conditions: locating the target using haptic feedback alone, locating it using visual feedback alone, and locating it using haptic and visual feedback together. The experimental comparison conditions were fully counter-balanced to reduce bias and ordering effects as much as possible. 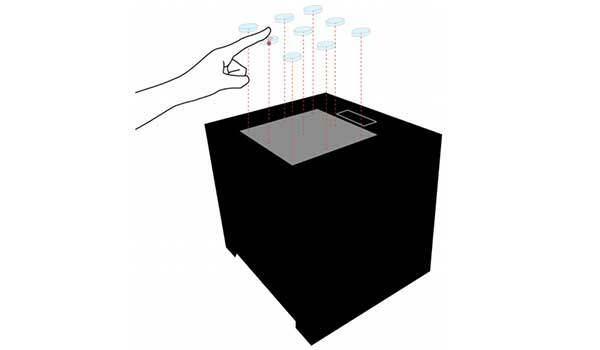 For haptic feedback alone, a pressure point was created in mid-air using the Ultrahaptics array. For visual feedback alone, a red cross on-screen represented the target location and a red point marker (also on-screen) was aligned to the x-y coordinates of the user’s index finger as it was moved towards the target. The user had to move his or her finger to bring the second marker on top of the first one. Simultaneous haptic and visual feedback combined both of these methods. 18 participants were asked to match their index finger to the target location as accurately and as quickly as possible. The study results showed that users perform slightly faster and 50% more accurately using just haptic feedback compared to using just visual feedback. Not only that, but the size of the virtual target could be made smaller (from 5.5 cm2 to 1 cm2) without significantly sacrificing precision or speed. Combining both haptic and visual feedback resulted in even greater accuracy. Mean precision error in millimetres. Error bars represent 95% confidence intervals. Precision was measured using the mean Euclidean distance between the exact target location and the user’s index finger. This is one of several academic studies that have investigated mid-air haptics and their application in control interfaces. 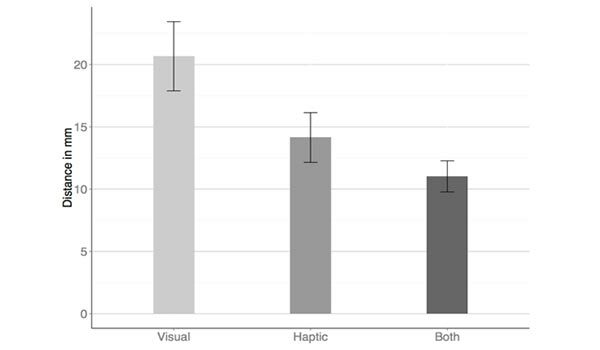 Through their results, we are now in a better position to understand how haptic feedback can improve gesture controls. If you are interested in working with Ultrahaptics’ technology to do ground-breaking research into haptics, HMI and user experience, then join our Academic Program. Ultrahaptics also offer a range of commercial products and programs for companies interested in integrating mid-air haptics with gesture control. For more information see Vo, Dong-Bach, and Brewster, Stephen A, “Touching the invisible: Localizing ultrasonic haptic cues.” World Haptics Conference (WHC), 2015 IEEE. IEEE, 2015. Aimed at facilitating academic research and providing universities with the technology enabling them to explore innovative solutions in haptics, HMI and user experience.